You may not know, but we add in our notebooking pages and lapbooks as enrichment. I guess I don't view us as "true lapbookers or notebookers". Don't you think a lot of homeschoolers view themselves as eclectic homeschoolers? We take a little of this and that from each homeschool approach and sprinkle it throughout our day. I think that is what makes each homeschooler's view point and journey unique. If you haven't tried to mix up your day by different curriculum and different approaches, take a chance. Get wild and taste homeschool freedom. Letting go doesn't mean no structure, it just means finding something that works better for your family. I think I would be a total whack a doo if I were to do all of "one" anything. 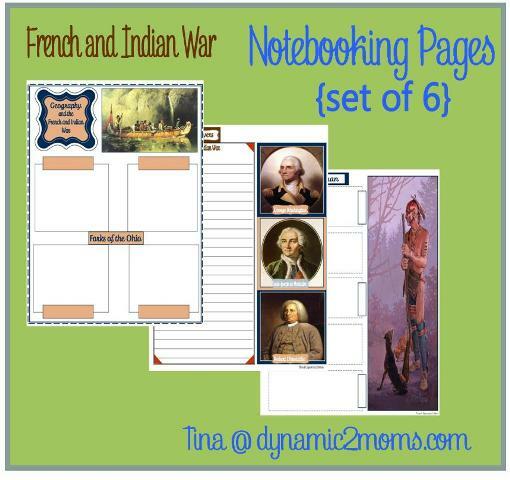 So after I sent you got the French and Indian war lapbook, my boys decided they wanted a few notebooking pages. We ended up doing six, but I just pictured a few here for you. I heard back from one winner of our give away but I am still waiting to hear back from one more winner. Sunny, you need to email me at Dynamic 2 Moms @ yahoo.com. "I used to think that anyone doing anything weird was weird. I suddenly realized that anyone doing anything weird wasn't weird at all and it was the people saying they were weird that were weird."